After the terror attacks on September 11th, 2001, terrorism and counterterrorism have become focal points in American law-enforcement. Perhaps the most important goal of counterterrorism in post-9/11 law-enforcement is preventing further attacks like the ones in 2001 from occurring. 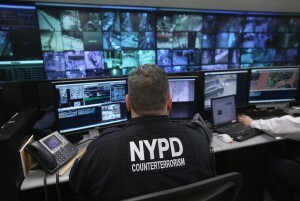 An important, yet contentious tool used by police to combat terrorism is surveillance. Police use surveillance to identify and gather information on suspects in order to attempt to arrest and convict these suspects before they are able to enact any acts of violence. 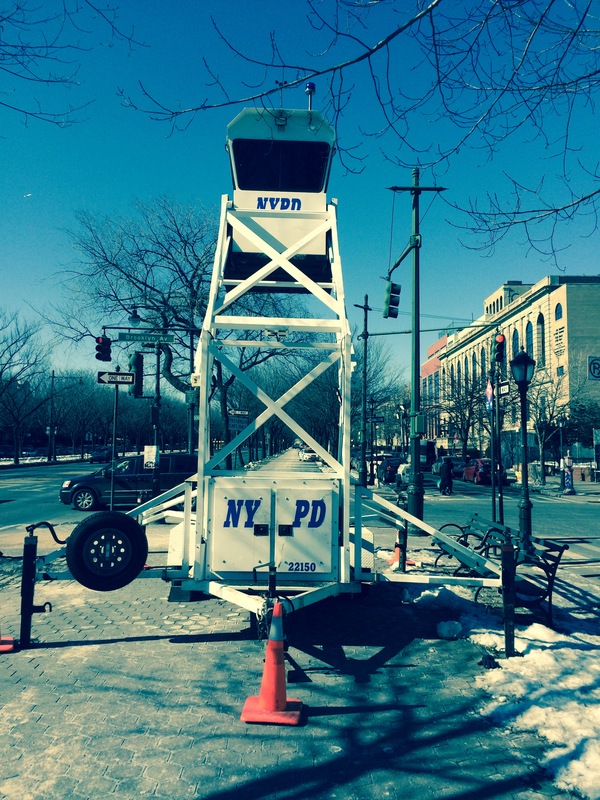 Post-9/11 police surveillance is intricate and complicated in urban areas. A variety of means are used to monitor and gather information about almost all urban dwelling individuals in some way shape or form. This usually happens as just an individual appearing on a public surveillance camera, but in many cases could potentially be something more involved if that person is suspected of some kind of wrong-doing. Different methods of conducting surveillance all intersect, respectively providing different information in a variety of ways giving law enforcement agencies a somewhat panoptic insight into the lives and behaviors of their suspects, and unfortunately in some cases, the rest of the general public. 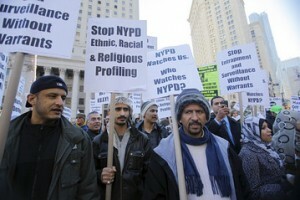 The American Civil Liberties Union (ACLU) and other community and civil rights groups claim that New York City Police conducted “blanketed” surveillance of Muslims living in New York City and its surrounding areas. It is alleged by the ACLU that the NYPD used techniques such as paid informants and creating reports about individuals and the path to participating in terrorist activities. In September of 2013, a group of Muslim community leaders filed a lawsuit against New York City that put into detail many of the grievances of the muslim community in New York. At the center of the lawsuit was a claim that the NYPD had created a “Demographics Unit” whose job it was to monitor the city’s muslim population. This unit collected and centralized information about the community, even labeling entire mosques as terrorist organizations. According to the Raza v. New York case, one commonly occurring complaint by plaintiffs is that they noticed NYPD officers were frequently physically watching them in their own neighborhoods as they went to work, to worship and continued their daily lives. Quite prominent in the allegations against the NYPD by members of the Muslim community were the frequent use of undercover police informants. It seems like these are commonly thought of as usual police practices: police use undercover agents even to pull over speeding cars on the highway. This type of “community policing”, however, represents an integrated network and infrastructure of NYPD philosophy and practice that dates back to about 10 years before the 9/11 terrorist attacks, and the onset of counterterrorism. “Community Policing” such as this, can trace its roots to the early-mid 1990s, when New York City Mayor Rudolph Giuliani and his police commissioner William Bratton implemented a new policing philosophy centered around practices such as the “Broken Windows Policy” and “CompStat”. “Broken Windows” rests on the presumption that small, petty crimes like graffiti or vandalism, if left unchecked, will create an atmosphere where more serious crimes can flourish. “CompStat”, despite sounding like a complicated computer program, started off as simply wall tacks on a map. CompStat is nothing more than “crime mapping”. By quantifying which crimes happen in which areas, police are told to patrol these areas with the expectation that such crimes will occur. One interesting aspect of CompStat is that the data it collects can be used to predict the likelihood of specific crimes in specific areas much like how a meteorologist uses past weather data to predict the likelihood of future weather patterns. Thus, law enforcement personnel conducting surveillance out on the streets will tailor their surveillance to focus on specific acts occurring in specific neighborhoods. CompStat and Broken Windows, work conductively together to paint a picture of neighborhoods and people. Police are given a panoptic view of people and their lives by monitoring and collecting information regarding them whether they are conducting or suspected of conducting criminal activity or not. Broken Windows represents a shift from monitoring for crime, to monitoring for behavior. While Muslim New Yorkers were not necessarily participating in any criminal activity, they were conducting behaviors as simple as attending worship at mosques in their communities, that the NYPD considered worthy of likening to the potential for terrorism. This “behavior” according to the NYPD’s application of CompStat and Broken Windows was enough to warrant these individuals being monitored. These two philosophies of surveillance shift the paradigm of surveillance and focuses the object of its infrastructure on gathering information about people, places, and their behaviors and monitoring them. In Raza v. City of New York, the plaintiff’s lawyers specifically site complaints regarding an electronic network that was collecting and processing personal data about his clients. Anyone who has walked the streets of New York City has seen some physical sign of surveillance cameras. Usually a large sign on a pole bearing the NYPD logo with a message reading “This Area Under NYPD Surveillance” can be seen in heavily trafficked tourist areas, as well as notices posted in many New York City Subway stations. One possible “culprit” that may represent the complaint found in the Raza case is the Domain Awareness System (DAS). The Domain Awareness System allows the NYPD to track and monitor incidents, or suspected parties while at the same time, officers can access information about individuals such as biographical data, and criminal history. The DAS represents one way that the NYPD is monitoring for perceived potential terrorist activity. 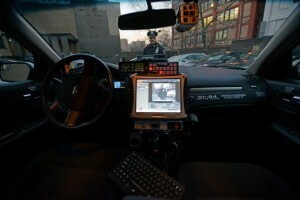 The Domain Awareness System also represents a potential cash cow for the NYPD. The New York City Police Department partnered with Microsoft to garner a deal that would allow the NYPD to garner 30% of the profits that Microsoft will make from selling the DAS system to other Law Enforcement agencies. In recent years, several other unnamed and unknown cities purchased the system from Microsoft, gaining the NYPD over $100 million. The New York City Police Department’s profit motive regarding the DAS raises even further moral issues.With large sums of money to be made by the NYPD from sale by Microsoft of the DAS, there is the potential for increased pressure on the NYPD to make sure that DAS produces tangible results like arrests and convictions. This pressure could potentially leave room for corruption and obstruction of justice on the part of the police. According to an NYPD press release the DAS “aggregates and analyzes existing public safety data streams in real time, providing NYPD investigators and analysts with a comprehensive view of potential threats and criminal activity” A synthesized explanation of the DAS would look something like this: when a 9-1-1 call is received, responding officers are provided with an integrated network of information regarding the situation they are responding to such as maps of the area, and footage from one of 3,000+ cameras throughout the city on a dashboard interface in their police cruisers. Information about suspects detected from the information, or the surveillance footage, is also provided to officers by the DAS analysis on their screens. Officers can view information in real time from their squad cars as more information becomes available and as events unfold. 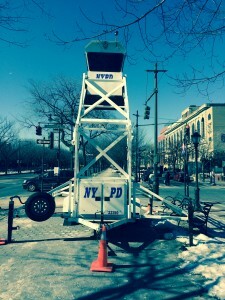 These techniques that the NYPD used to conduct surveillance on NYC Muslims demonstrate the infrastructure of surveillance. Surveillance is not just visual monitoring. It is much more than hidden cameras on the subway station. Institutions and programs enacted and practiced by the New York City Police Department like CompStat, Broken Windows, and the Domain Awareness System represent the way that such a variety of information is collected, processed, analyzed and then brought together centralized to paint a proverbial picture about communities and individuals by the NYPD. The practices are intricate and every detail is interconnected. What is noteworthy about the DAS and the Broken Windows/CompStat brand of Community Policing, is that it presupposes no notion of any kind of criminal activity. These systems focus on monitoring and collecting data on individual human behavior in and of itself rather than on any specific actions committed by those under watch. All surveillance conducted under this infrastructure is entirely preemptive. With CompStat and Broken Windows and DAS in the case of Muslim Surveillance, individuals and communities are being monitored simply due to their religion and the way that they practice it. James Wilson and George Kelling: “Broken Windows: The Police and Neighborhood Safety.” The Atlantic. March 1, 1982. Stephanie Slahor: “NYPD and Microsoft’s Coordinated Surveillance and Crime Data”. Law and Order. Volume 60, Issue 11. November, 2012.